Not all wines should be stored. While some require a long aging to show its full potential, others do not gain anything with the fact that they are saved. In order to "build" a cellar properly, one must begin by seek advice with a winemaker on the wines to select. Each one’s personal taste should dominate, never the less there is nothing better to start a wine cellar than providing it with a bit of everything that is most important in Portugal, without forgetting that there are great foreign wines that deserve an attention. There are standouts that normally ages well like full-bodied wines with good balance between alcohol and acids, both reds and whites. In its ideal form, the cellar should be a broad division (usually a basement), with a single port, preferably facing north. You should only have openings near the ceiling, protected with a network of very fine mesh, thus sheltered from sunlight, drafts or steam, shaking or strong smells and maintaining a temperature between 9 ° and 13 ° C with no significant variations between stations the year. One advantage of the basement is to maintain a moisture content (around 70%) that will help keep the corks in good condition. It should, however, far exceed this value at the risk of encouraging the emergence of insects, which can damage the cork and spoil the wine. For a more rigorous control, it should exist in a cellar thermometer and hygrometer (to measure humidity). Still, if the size of the cellar is justified, is useful a book to record the existing wines. 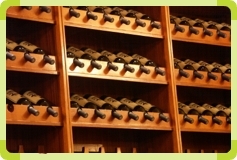 It is an important factor in wine of "pasture" (the red and white that are not generous, liqueur or sparkling), that bottles lay back down, providing contact between the cork and the liquid thus expanding the first and therefore sealing better the entrance of air to prevent excessive oxidation. If the wine is aging in wooden casks, the movement is beneficial. Producers sent their wines on long journeys by boat, because they asserted that the natural movement of the waves did wonders in wine aging.